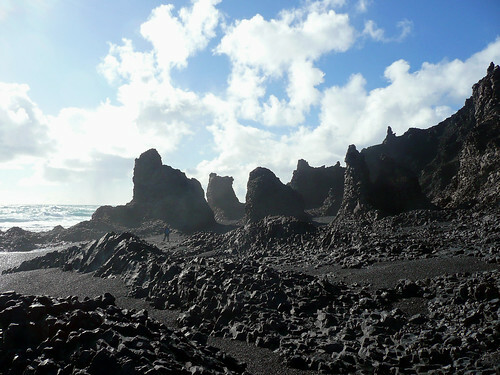 On saturday we took a short trip all the way to the tip of Snæfellsnes along the south coast of it. When we left Reykjavík around 11am the weather was perfect: blue sky, some beautiful white big clouds, the sun shining beautifully, a soft breeze and 5°C. Just perfect. 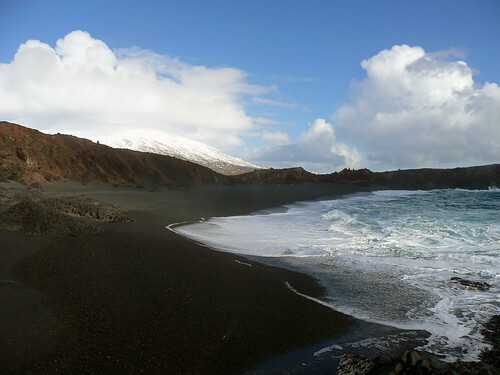 The plan was to drive all the way to Djúpalón, definetely one of my (many) favourite places. 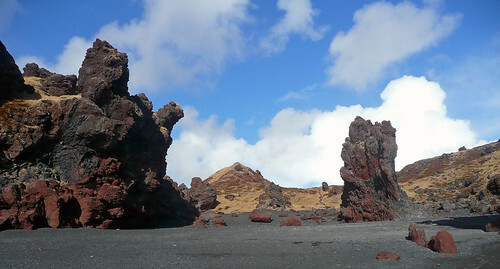 It is a lava field almost on the tip of the peninsula right in front of (the famous) Snæfellsjökull. 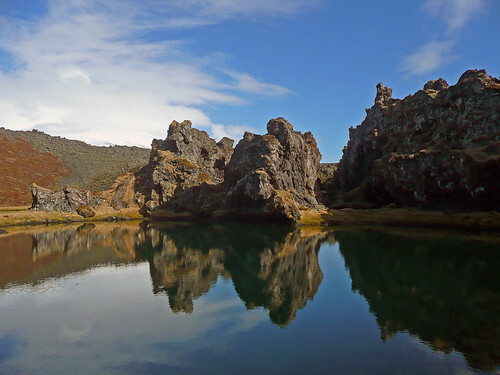 There are two lagoons with perfect clear water that are surrounded by some crazy lava formations. It was so still that the water was almost a perfect mirror. Breathtaking. There is also an amazing black-stone beach where the rusty rests of an old english ship (that ended up there after a bad storm in the 40s) are spread all over. 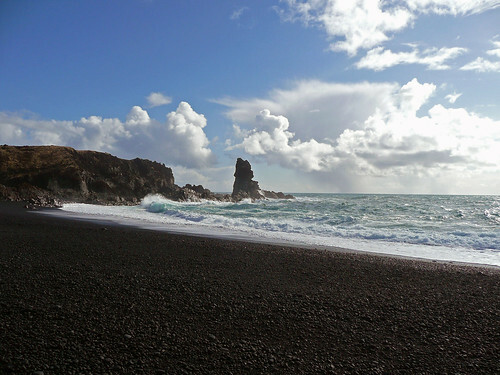 The stones in the beach are all black and wonderfully polished and in the most perfect shapes you can imagine. We were trying to pick up some cool stones to send to Rosana, an argetinian raveler that makes wonders with stones and crochet. We picked up quite a lot of stones so soon some of them will be travelling all the way to Argentina! 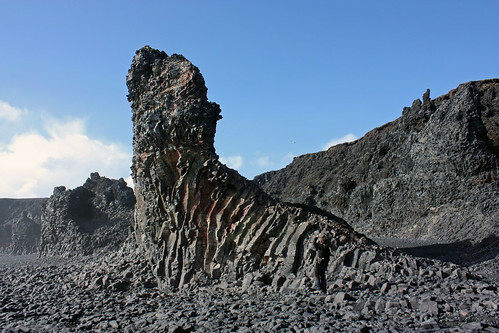 On one of the ends of the beach there are these big lava towers that look like giants walking to the sea to take a dip in the water. It was amazing to be really close to the shore where the waves break and hear the sound of millions of stones being pushed and dragged by the power of the water. On the way back home everything suddenly changed. Dark clouds took over, the temperature went downt 1°C and began to snow like there is no tomorrow. Unbelievable. Now, while I am writing this... it still (soflty) snowing outside :) So it seems that winter still doesn't want to leave us. *During most of the trip we were listening to Björk. It is amazing how much sense her music makes when you are out there in nature. It is so easy to understand where her music comes from. It is somehow so organic. amazing! awww but you do not have any pictures of the snowstorm? Thank you so much for your nice and generous words. With comments like your who wouldn't feel encouraged to continue blogging? I hadn't noticed the lion head and bear body! Knitting actually kept my sanity, I can tell you that, hehe. Med school: finished. When I moved to Iceland things were a bit shaky but things are back on track and I am now: working in the health care field + studying icelandic + knitting as much as time allows. Thanks again for your comment again! One question: do you knit? Snæfellsnesið er ÆÐISLEGT! Sérstaklega Djúpalónið og Dritvík. Ég hlakka svo til í að fara þangað aftur í sumar! :-( Það tekst örugglega næst - fátt er betra en fallegur sumardagur á Snæfellsnesi!